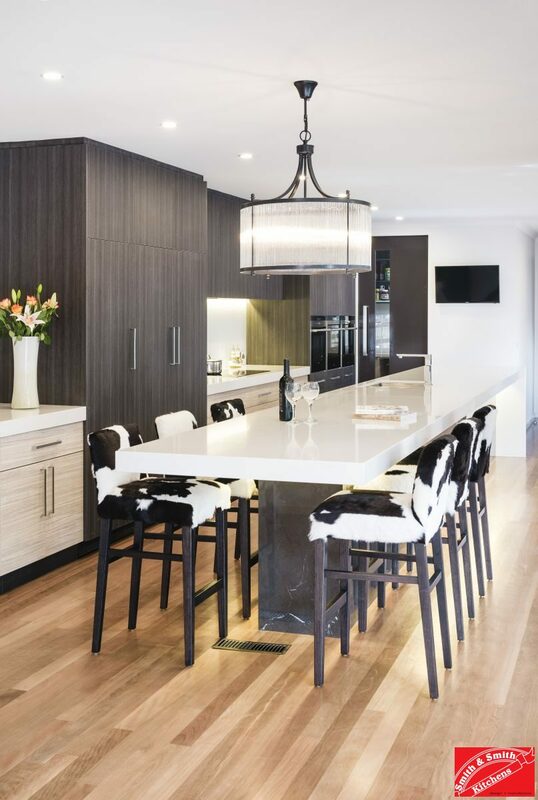 As part of a complete renovation of an ageing apartment in Toorak with gorgeous views of the city, this kitchen needed to breathe new life into space yet be understated as it was now part of the main living area. 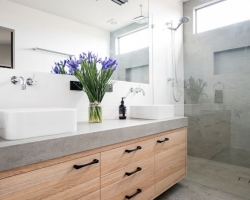 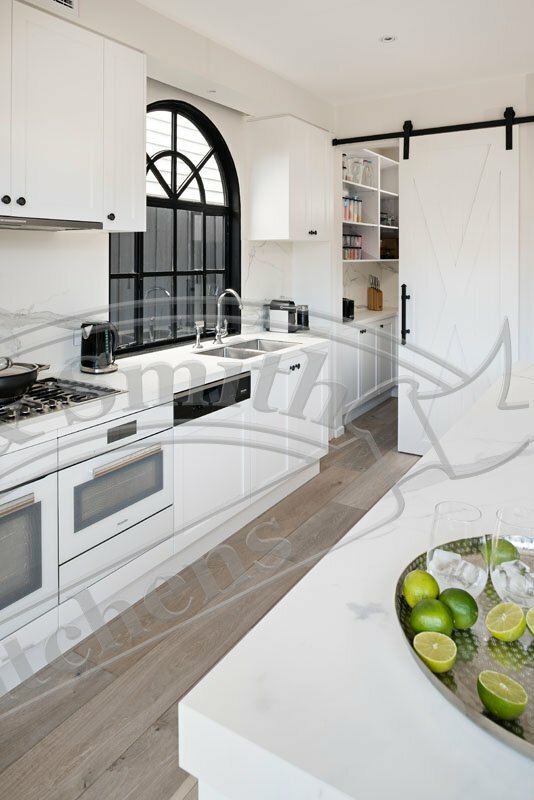 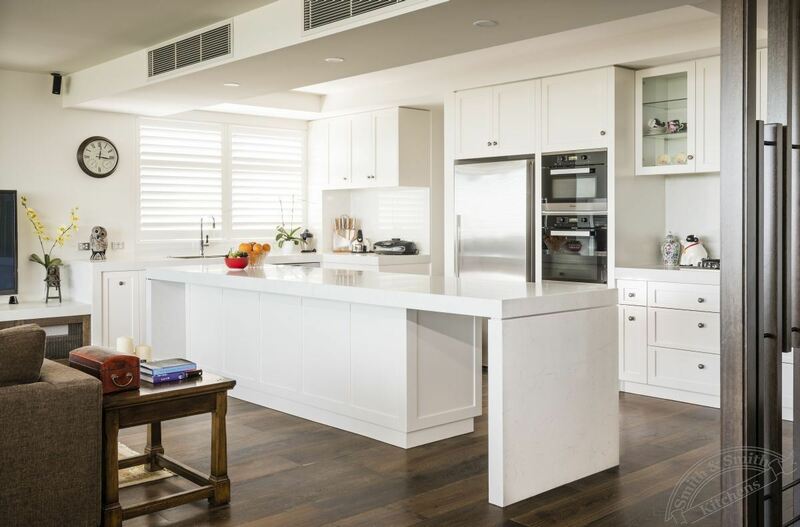 The shaker style doors and 80mm Carrara composite stone bench tops and waterfall legs give it presence without being the focal point of the space. 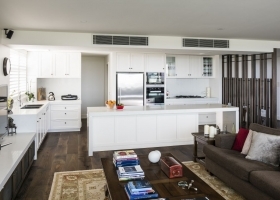 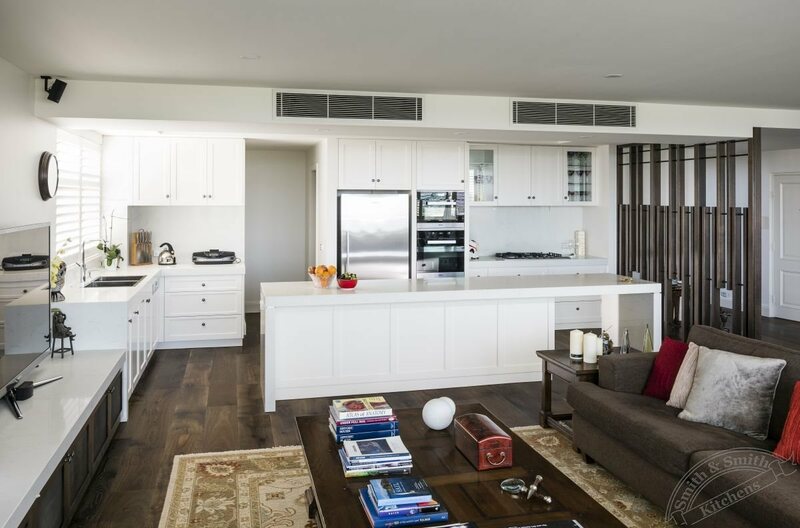 The sliding timber screen which shields the kitchen from the front door ties the kitchen beautifully to the entertainment area, the study and the main walk in robe, providing a theme throughout the apartment. 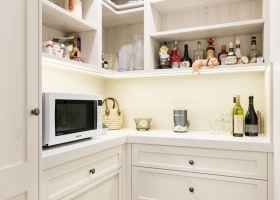 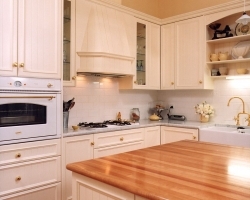 The cabinetry and feature panels were manufactured with a classic shaker door panel. 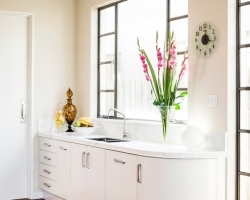 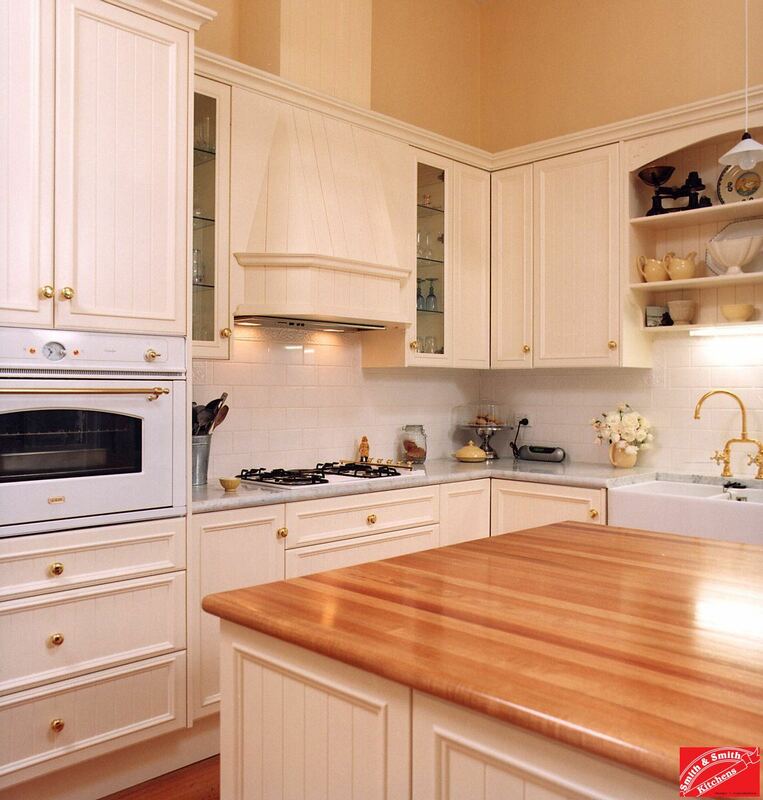 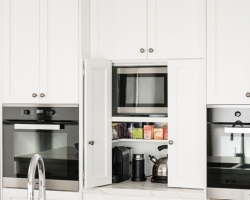 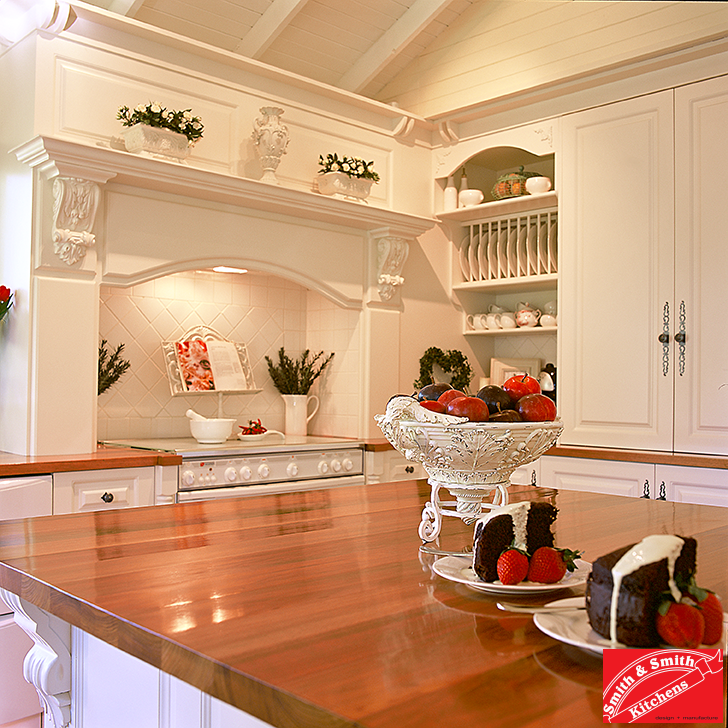 All cabinetry was painted in Dulux ‘Antique White’, 2pk polyurethane paint in a satin finish. 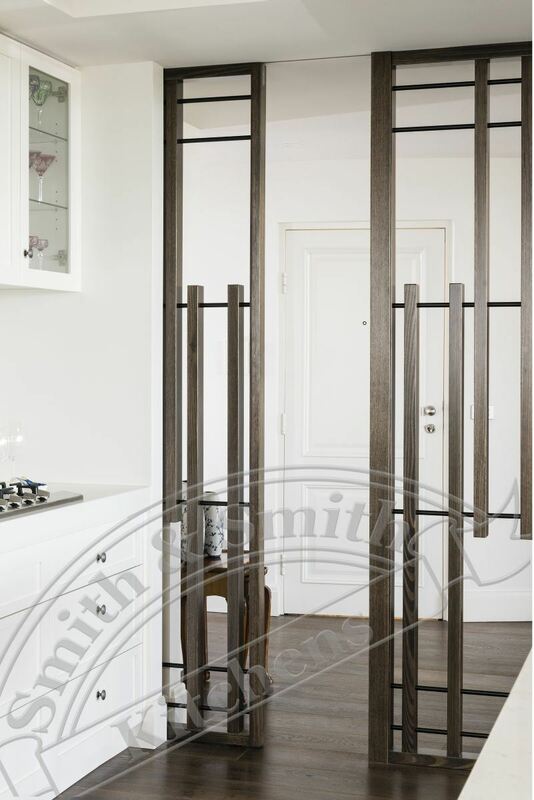 The timber screen was manufactured from Solid Australian Hardwood, stained Walnut with a 2 pack polyurethane satin finish. 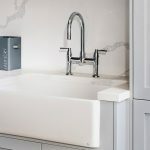 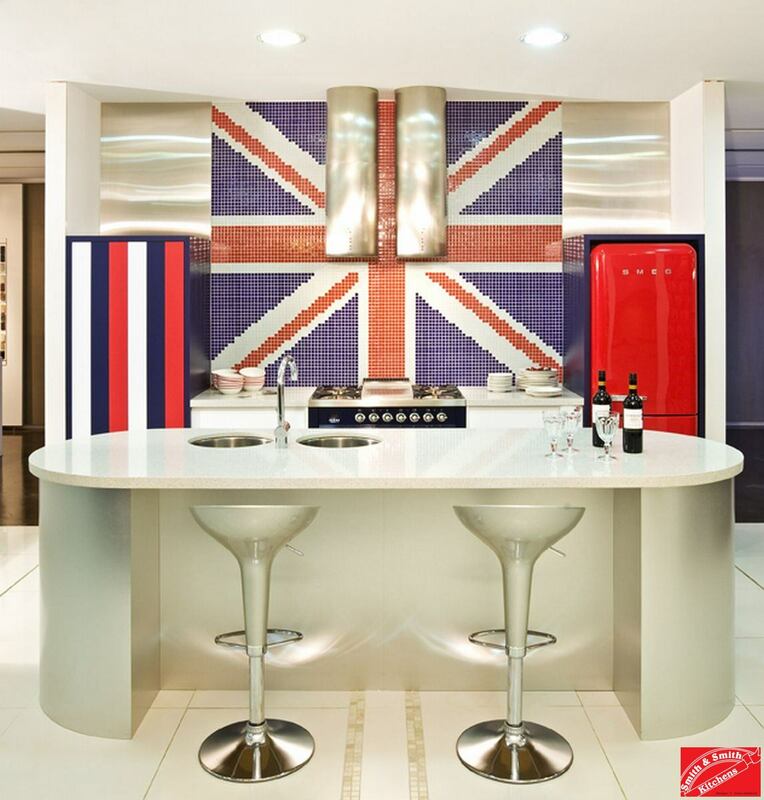 It was designed as an element of interest and the focal point when you walked through the front door, rather than looking straight into the kitchen. 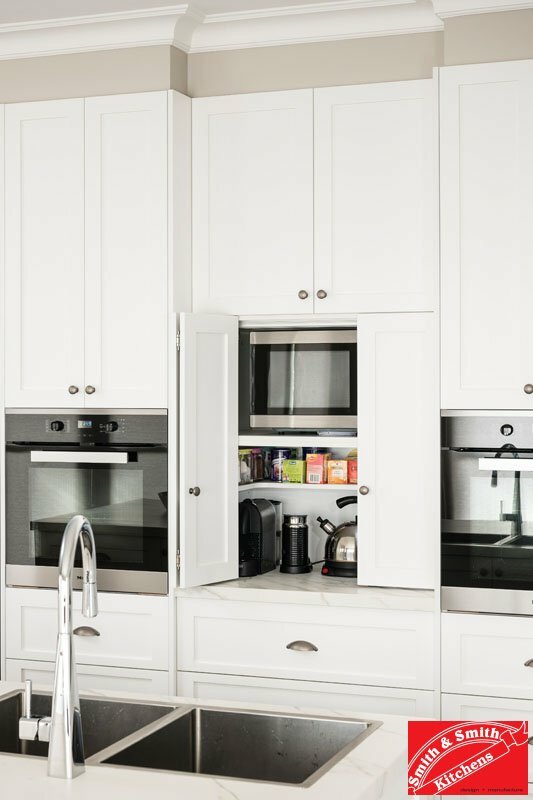 Adding the sliding mechanism ensured the client ease of access to their kitchen and throughout their home when convenience was more important than aesthetic. 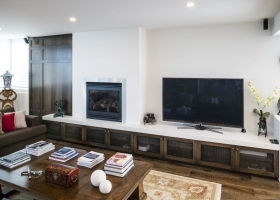 The material was chosen and stained to be the same colour as the entertainment unit, linking these two spaces together. 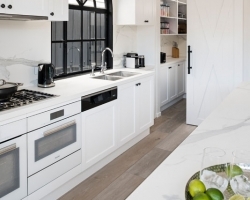 The bench tops were 80mm Lithostone White Carrara composite stone. 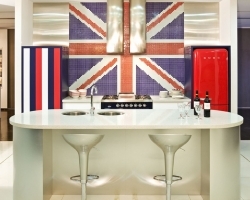 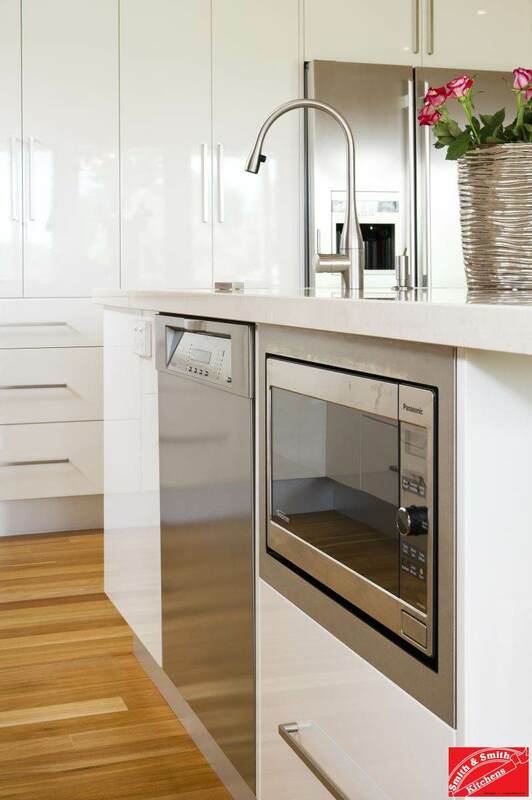 The splashbacks were Lithostone White Carrara composite stone. 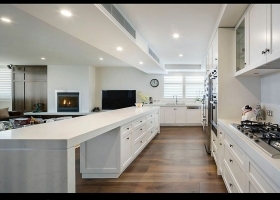 The client wanted ultimate organisation within the drawers and cabinets and has Blum orga-line solutions for utensils, oil bottles and trays, divisions for pot lids and pans and spice holders. 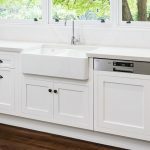 Also mandatory was a large double bin on an electronic touch open BLUM servo drive mechanism and a Kitvac vacuum system integrated into the kicker under the sink. 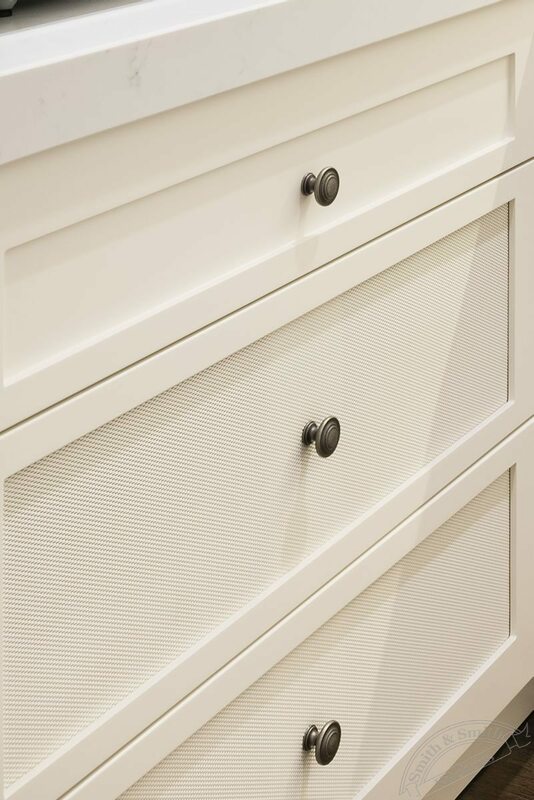 One of the drawers houses a pullout ironing board so the ironing can be done while watching tv and stored neatly away when finished. 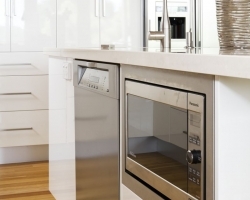 The cabinetry hardware is Blum Antaro full extension drawer runners and Blum soft close hinges. 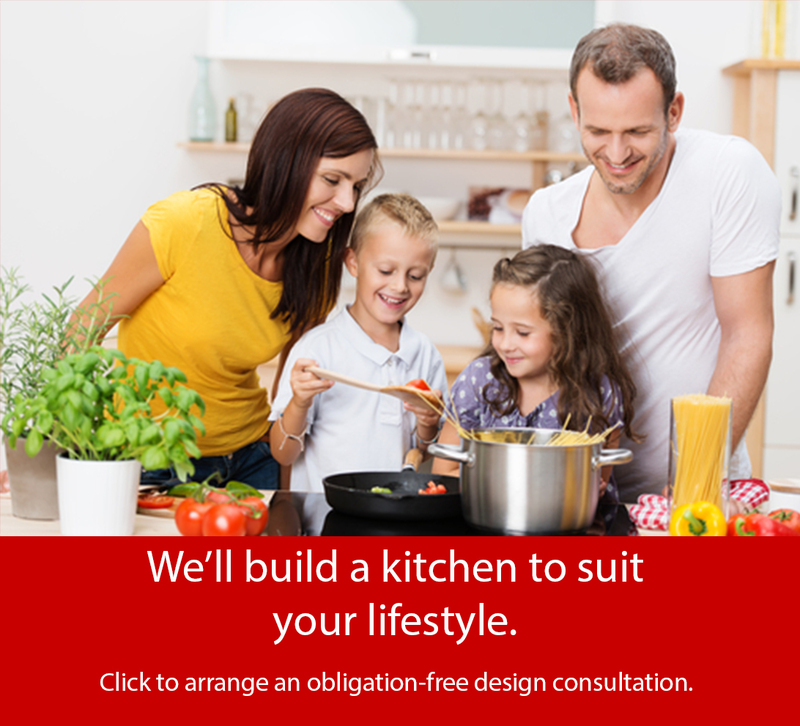 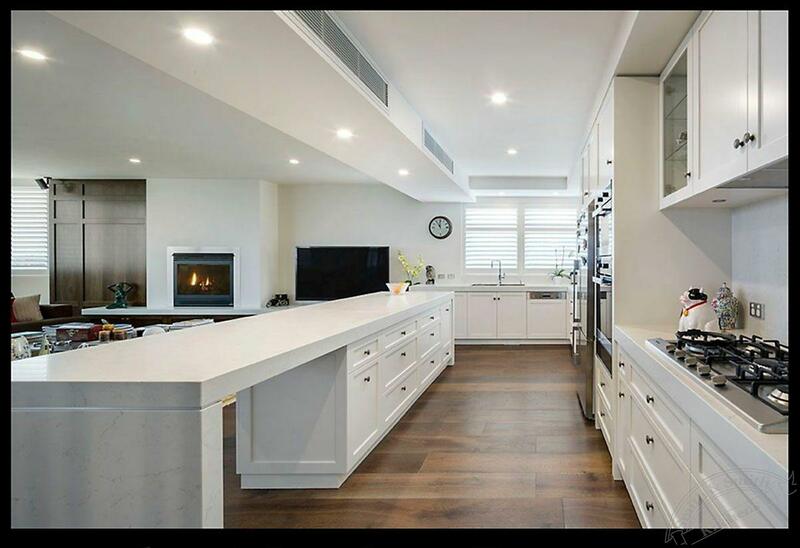 The client wanted a large benchtop with a thick profile but didn’t want the space too heavy. The design solution was to create an open space at one end of the bench, braced with steel for support to give the appearance of fluidity through the room. 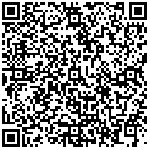 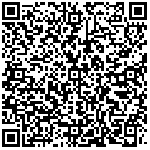 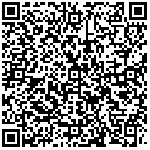 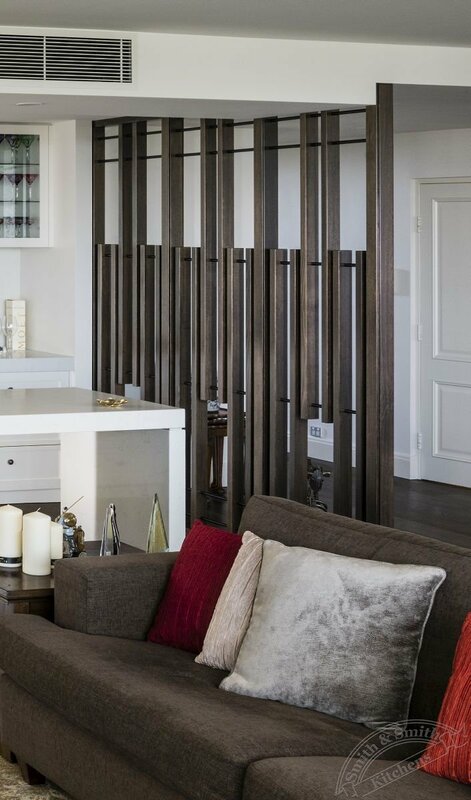 The Shadowline between the top and the waterfall leg also contributes to the softness of the finish. 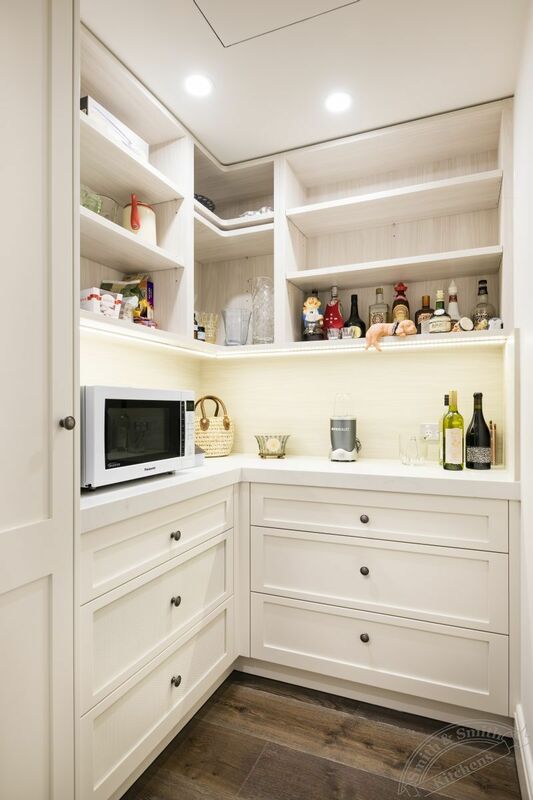 A small butler’s pantry backs off of the kitchen next to the laundry. 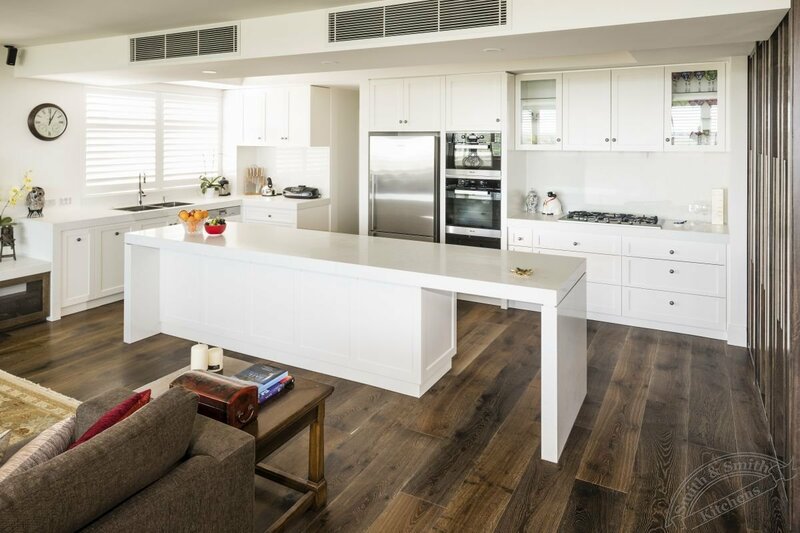 It was fitted out with the same cabinetry and benchtops and used Polytec melamine Legato ‘Bleached Walnut’ for the overhead open shelving. 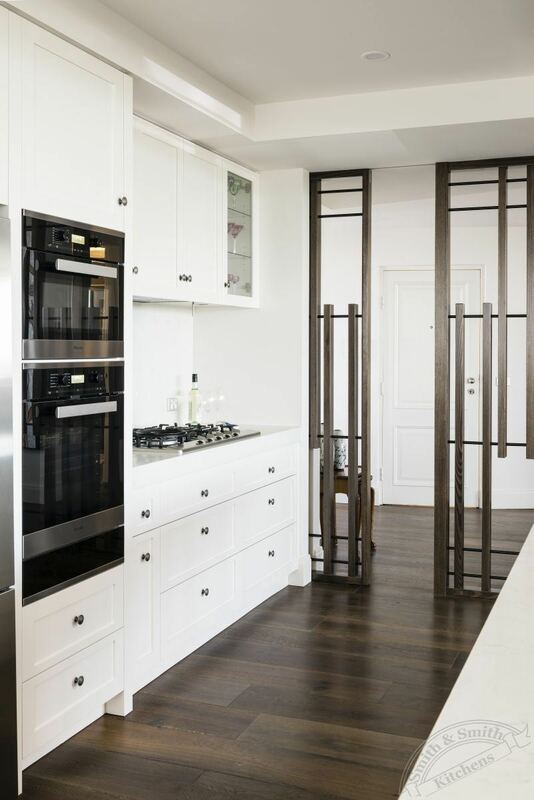 Timber wall panelling and cabinetry with antiqued mesh provide interest and relief from the white walls of the refurbishment. 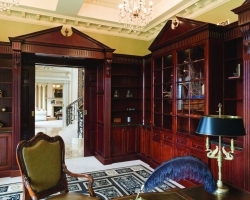 The client wanted his study to emulate a traditional library so the panelling was designed as such. 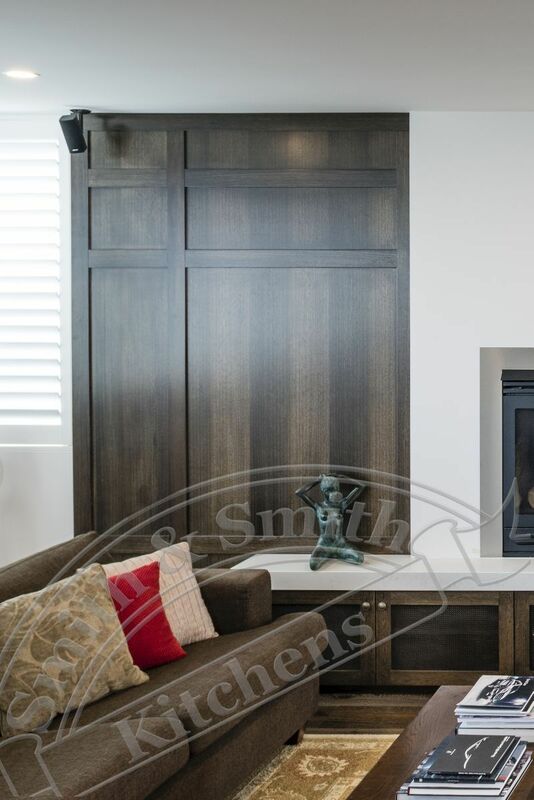 Bringing the same element into the entertainment unit ties these rooms together and the client can see the fireplace and panelling when sitting at this desk. 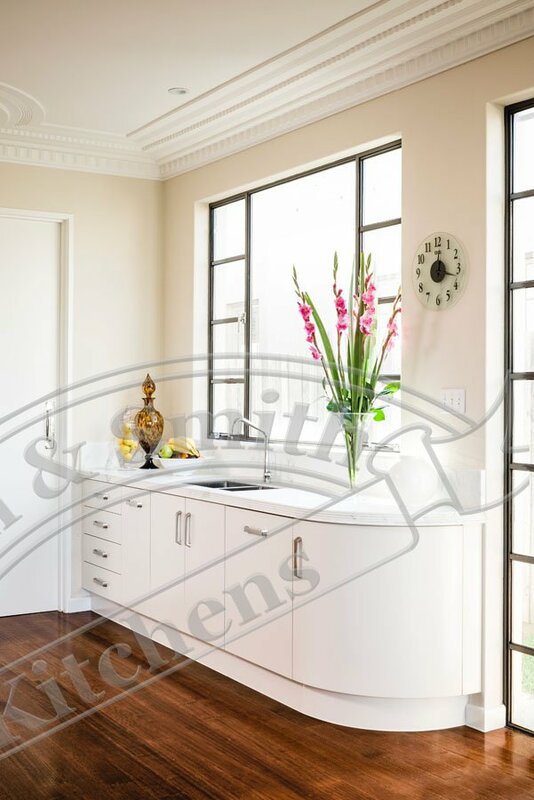 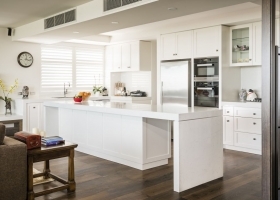 The cabinetry doors were manufactured from solid Australian Hardwood in a classic shaker door panel, stained Walnut with a 2pk polyurethane satin finish. 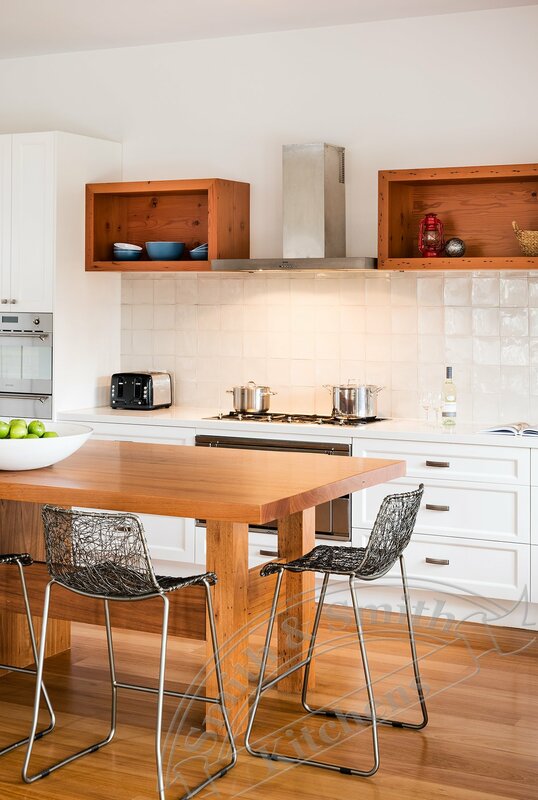 The centre panels were constructed from brass mesh that went through an antiquing process to create the desired patina. 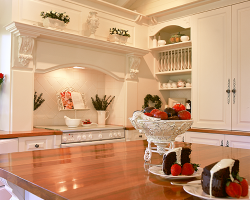 The interiors of the cabinetry were lined with Polytec Melamine ‘Belgian Oak’. 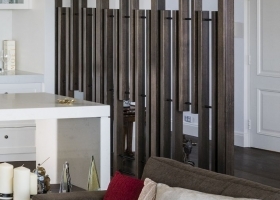 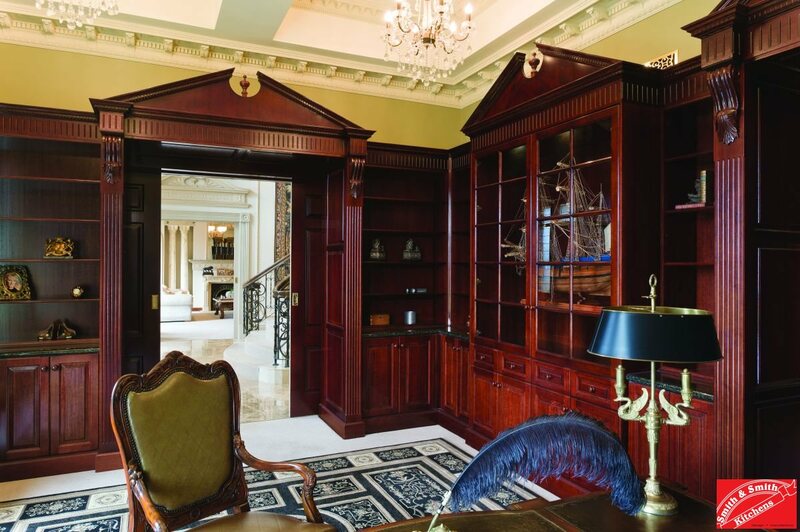 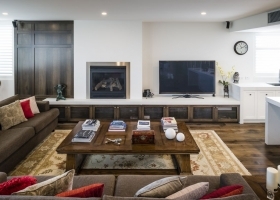 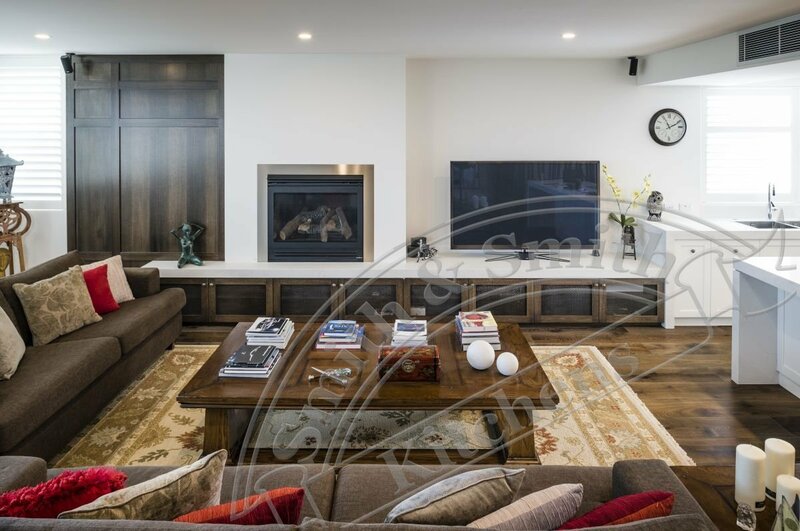 The wall panelling was manufactured from solid Australian Hardwood planks and veneer backing, stained Walnut with a 2 pack polyurethane satin finish. 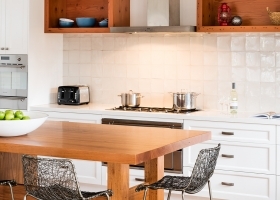 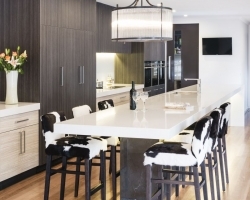 The bench tops on the entertainment unit were 80mm Lithostone White Carrara composite stone to match the kitchen. 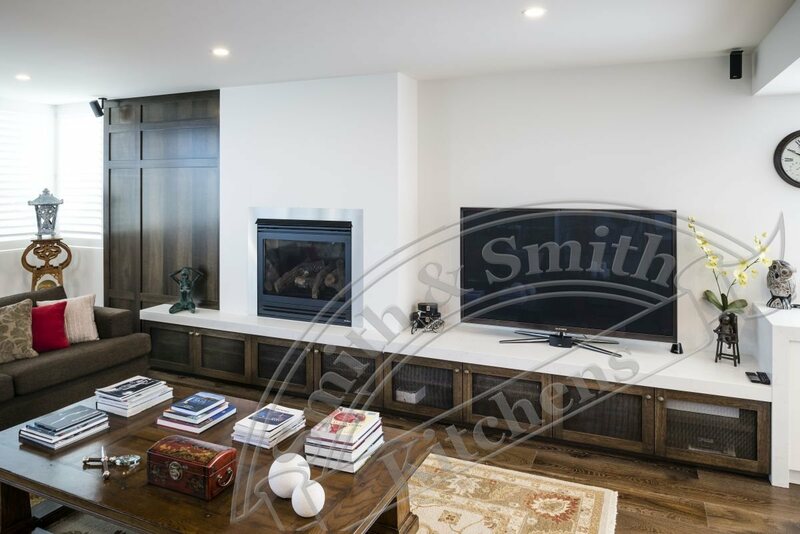 The antique brass was used both as a design element to prevent the cabinetry from feeling heavy and for the functionality for the client to utilise his AV equipment. 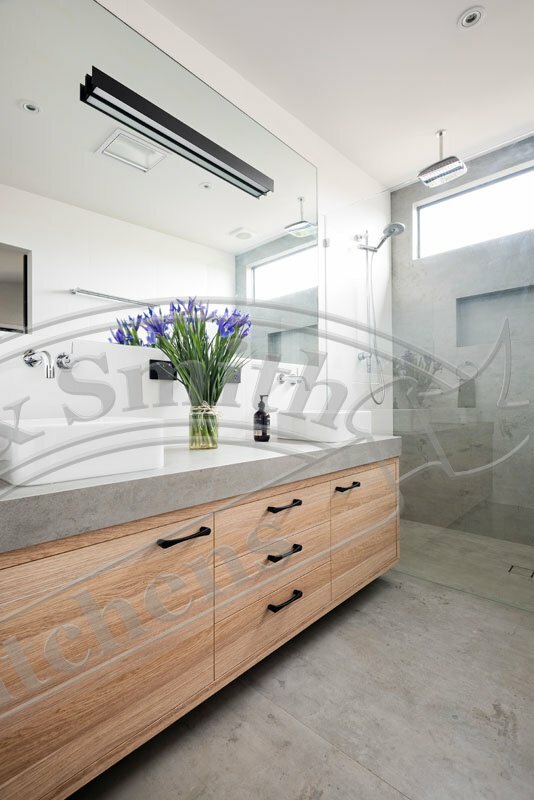 In the study, the mesh provides easy viewing and access to the client’s important work folders. 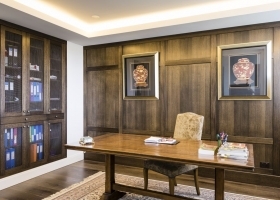 A custom designed felt-lined bench on runners was designed in the study between the overhead and base cabinets so the client can rest his folders on it while looking up documents. 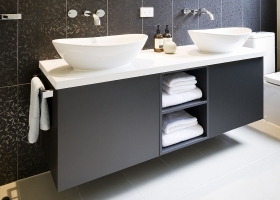 The cabinetry hardware is Blum Antaro full extension drawer runners and Blum soft close hinges. 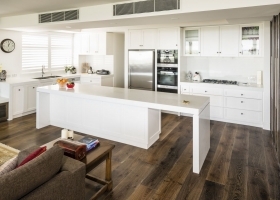 The challenge with the stain selection was to have it compliment the chosen floorboards but not appear too dark and heavy. 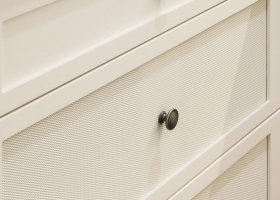 5 Hallway and bedroom closets with external doors in Dulux ‘Hogs bristle ¼’ Satin 2 pack exterior and ‘Almond Sand’ melamine internal fit outs. 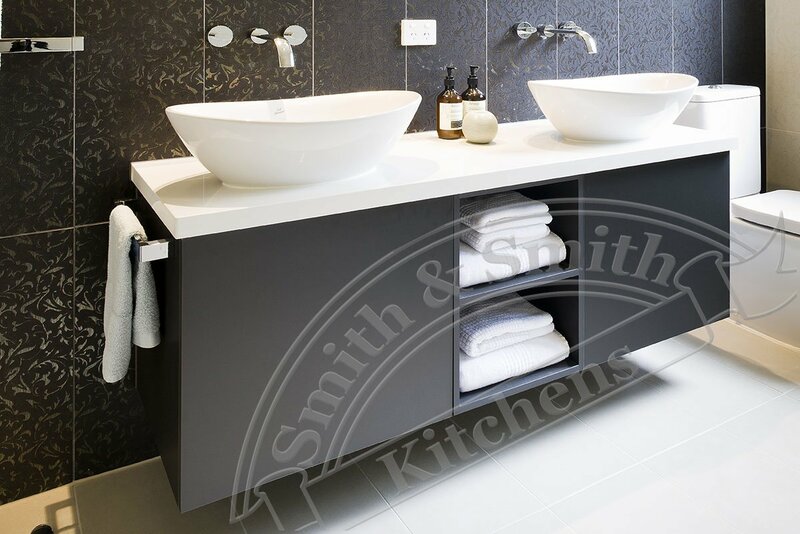 2 Vanities with shaker style drawers and doors in Dulux ‘Hogs bristle ¼’ Satin 2 pack as well as 2 mirrored shaving cabinets.